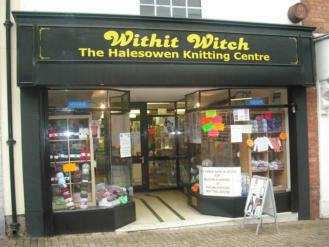 About US Withit Witch was first opened in Halesowen back in September 2006. At that time we stocked mainly Sirdar, backed up with Stylecraft and James C Brett. Soon after opening we took in DMC, stocking threads, fabrics and some kits. A Derby shop closure in 2008 helped us to double in size, and we took on some Rowan yarns. Unfortunately, the Rowan didn't take off in the area, so our stocks were sold off. In August 2009, the shop moved from the outskirts of Halesowen into the Town Centre. We are now located in a lovely old property - the oldest shop in Halesowen, built in approximately 1452. We know we aren't alone here! But its a lovely atmosphere. We are now a stockist of Sirdar, Stylecraft, West Yorkshire Spinners, Cygnet and Ramsden's yarns and patterns. In 2018 we have brought DMC back into the business and are pleased to say that we are part of the Embroidery Partner Scheme. This means that each month we receive a selection of new kits currently not available to buy outside of the scheme. We have a large selection of knitting accessories and haberdashery, including loose buttons, ribbons and Gutermann threads.